In both our old studio and our new space, we’ve been blessed to be within walking distance to Two Hands NYC (first the restaurant, now the cafe). Owned by two handsome Australians Henry & Giles (what? It’s an important detail), there’s a lot to love about the fresh and vibrant fare they serve. But perhaps most lovable of all is the Banana Bread with Espresso Mascarpone. We first devoured it on a team outing to the cafe, and then devoured it again when Pia returned from the shoot with two slices. They were gone in 5 minutes, no exaggeration. It’s soooo good, and it’s gluten free, and now, you can make it at home, handsome Aussies not included. 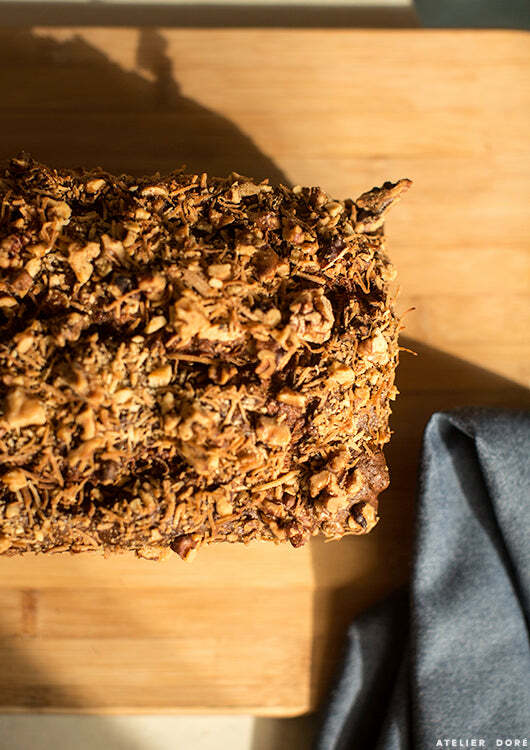 Today, a conversation with the Two Hands owners and a recipe for the banana bread. Please make it and report back, I’m not done talking about it yet, and maybe never will be. How did two Australian’s come to own a restaurant in NYC? Henry and I moved to New York for different reasons but when we both arrived it struck us that the style of cafe we enjoyed going to back in Australia didn’t exist in NYC, so we thought that if we wanted somewhere like that to hang with our friends and drink coffee, we should build it ourselves. We really focused on delicious coffee, nutritious food and community. Favorite part of being restaurant owners? Favorite part is definitely the people, both our staff and our guests. We’re here on earth to create lasting meaningful relationships with each other and it really feels like in hospitality we get paid to do that, which is amazing. First we want to build a restaurant company where the number one focus is wellness – of the people who work for us and the people who dine with us. Our goal is to continue to find places where a concept like Two Hands is needed and become part of that community. Henry and I actually discussed this just the other day. We couldn’t just have one single meal but more a table of different dishes because that’s the way we love to eat. So we’d have your classic Italian lunch table, cheese and charcuterie, fresh pastas, delicious salads, pizza straight from the wood fired oven and a few amazing bottles of wine. That way we could spend hours easting and drinking, celebrating food and life before we said our last goodbyes. Whisk eggs, yoghurt and milk together in a bowl. Add sugar and melted butter. Continue to whisk until sugar has dissolved. Mix in flour, baking soda, salt and bananas. Whisk until flour is totally combined. Fold through walnuts. Grease bread tins. Divide batter evenly and top with crushed walnuts and dessicated coconut. Bake for approximately 1h 20mins or until cake tester comes out clean. In the kitchenaid with the paddle attachment, slowly whip the mascarpone. Once the mascarpone has softened, add the espresso and the confectioners sugar. Tip: It is important that you don’t over-whip the mascarpone. It will split. If you under whip the mascarpone, it will be too loose to sit on the banana bread. The mascarpone must remain cold at all times. Slice banana bread and lie on a plate. Top with espresso mascarpone, puffed buckwheat and honey. Looks yummy but the recipe is huge.